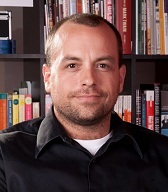 WriteByNight co-founder David Duhr (New York, New York) is books, fiction and copy editor at the Texas Observer and contributes regularly to the Dallas Morning News, Publishing Perspectives, and other publications. I grew up in Milwaukee and have since lived in: Denver; Boston; Washington, D.C.; Austin; Florida; and now NYC. Love ’em (Boston) or hate ’em (Denver), all of these places inform my writing in some way or another. I went to three colleges and have one degree. The key writing lesson I took away from them: You learn far more outside of the classroom than inside. That colorful style helped me transition seamlessly into reviewing books. I began contributing to a books website some friends ran, as well as to Fringe Magazine, where I was on staff in the fiction department and eventually became managing editor. My first assignment came from the lit journal Pleiades (thank you, Kevin Prufer); and my first paying assignments came from the Iowa Review and Gulf Coast, almost simultaneously. These days I write regularly for the Dallas Morning News, the Texas Observer, Publishing Perspectives, and others. Seeing a writer reach his or her goal(s). It sounds like a simple answer. It’s not. Staying motivated and on task through the middle of a project, after the excitement has worn off and when the ending still feels years away. I once published something of an open letter to a specific writer. I thought it was gorgeously witty, and the right kind of sarcastic, and I was very self-satisfied. I couldn’t wait for it to run, because I knew it would bring me lots of compliments and that fun attention some of us so desperately need. Instead, I got emails telling me that I was off base, mean-spirited, and not at all amusing in any way. And not one compliment. The lesson? I dunno. I still think the thing was funny, so clearly I haven’t learned anything. The Safety of Objects, A.M. Homes’ 1990 story collection. A.M. Homes is never dull. Don’t be afraid to ask for help! Don’t be afraid to accept unsolicited help. And don’t be afraid to offer help. So many writers are competitive with other writers, but it doesn’t have to be that way.